Haruka had her very first school performance last Wednesday. I managed to squeeze a day off and make the performance, and it was well worth it. Haruka had been practicing playing the melodica (a small organ-like musical instrument) for months at her school. At first, I was expecting just a bunch of 3 years making a lot of incoherent noises with their instruments. And to keep it real, it turned out to be only marginally better than my expectation (at least for Haruka’s age group), but the four and five year old groups were amazing. If I closed my eyes, I would swear that it was a high school band playing rather than a bunch a of kindergartners. This show really renewed my my expectations on what this school can do in terms of teaching children some amazing things. I do wish that they would focus a bit more on behavioral control as well, because Haru has been pretty bratty lately. She is currently being punished for being really disrespectful lately. I have basically hidden all of her dolls (which she’s found already) until she learns to be more respectful. So far, it’s kind of working, but she still has a ways to go. Last week was Haru’s first week of kindergarten. For the most part, she seems to be enjoying. The good news is that she seems to have already picked up some new vocabulary. The bad news is that a lot of it seems to be from a foul mouthed little boy who sits next to her. My wife and I are trying to teach Haru that the words that she is using is not very lady like and that she should not use them any more, but she keeps saying ” but the boy who sits next to me uses them all the time”, to which I instructed her to tell him that he is being rude the next time he does it. I am not too keen on having to do remote controlled parenting through my daughter, especially for someone else’s child. Another incident that occurred last week is that Haruka came home with a moderate sized gash on her right cheek. It very obviously looked like she was scratched by someone with very long nails. I immediately interrogated Haru for some answers on how she got the gash, but of course since she is only 3 years old, much of her story was inconsistent and and didn’t make too much sense. I did get that it was a boy, and the boy grabbed her cheek, but she didn’t want to say who or why that boy did it. Kids being kids, I wasn’t too concerned too much as to who did what or why per se, I was more concerned as to why the teacher didn’t say anything to us about it. Even a simple note pinned to Haru’s uniform explaining what happened (like in the old days when kids were sent home for being bad) would have sufficed. Since the orientation meeting last week, I haven’t been too crazy about Haru’s teacher. She seemed to be too young, too inexperienced, and just lacked control of the kids in the classroom. I suspected that she she would lose control at one point or another, but didn’t expect it to happen this soon. Having said all of this, Haru seems to like this teacher. She says that she’s nice, so I guess at her age that’s what’s most important. But I will definitely need to step in if Haru comes home with anymore unexplained gashes on her face. I am not trying to be an overprotective parent, and if Haru comes out and tells be that she fell or that it was in some way her own fault, I wouldn’t mind it so much. But an unexplained bleeding gash on her face, with no intervention or explanation from the teacher is not acceptable. Lately, Haruka has been involved in a lot of extra-curricular activities. She has been attending her usual pre-school, which is now once a month, as well as starting gymnastics and going to English pre-school. I have notice good strides in her English abilities. She’s got a good sized vocabulary and she seems to understand me when I speak to her in English. She’s still not very good a forming complete sentences (in English yet). She can say This is a _______, but often times forgets to say a or is, and her speech is a bit choppy. I guess this will improve with time, and I just need to be persistent in teaching her. Another thing she is having a hard time with is remembering colors. It seems that when she doesn’t remember a particular color, she’ll default to blue. So if the color is yellow, and she can’t remember the word yellow, she’ll say blue. She is very good with tangible objects and nouns, especially animals and food items. Sometimes she surprises me when she actually remembers things that I had only taught her once, or never taught her at all (undoubtedly, something she picked up from either TV or her English pre-school). This is a period when she is able to pick up things at a very alarming speed, probably faster than she’ll be able to learn any other time in her life. Therefore I think its really important to get her more exposure to English language, much more than I can offer and even more than her English pre-school can give her. The only way I can really think of to get her 24/7 exposure (or close to it) to a native English environment, is to send her to the States. So from the 19th of this month, Haruka will be spending 6 weeks in Atlanta with her grandmother. During her six weeks abroad, she will be attending a privately run pre-school so she will be among other children about the same age. Hopefully, this constant exposure to teachers and other children who speak English will force her to learn native level English. When she returns from the States, my plan is to not speak to her in Japanese anymore, and to maintain her English by speaking to her in English and continuing my own English lessons with her. For the last few weeks or so, Haru has been showing signs of the terrible two’s. Most of the times, she’s not that bad, but there are times when she makes me miss the colicky days. Last night was one of those days. He spell of the terrible two’s usually comes around dinner time. Up until now, she hasn’t been too particular about what she eats, but lately she has been very picky. But the strange thing is that she is picky only at dinner time. It wouldn’t be so bad if she just refuses to eat some things, but Haru has been developing a bad habit of chewing her food, then spitting it out. The she would ask for more. And of course we would refuse it, and then she would throw a tantrum. Furthermore, when she throws a tantrum, she usually crawls into my wife’s lap, making it difficult for her to eat dinner. Well, last night I decided to introduce some discipline into her life. When she threw her usual tantrum, I pulled her away from the dinner table and into the next room and made her sit down in front of me and face me until she stopped crying. It took a few minutes, but eventually she stopped crying. After that I basically told her that she had a choice of either sitting down at the dinner table and eating her food, or going to bed. She seemed to understand me, because she said she wanted to go to bed. She had a quite an eventful day yesterday, so it could be that she was just sleepy. One other factor that indicates signs of the terrible two’s, is the constant need for attention. An example of this, is when my wife and I try to hold a conversation without including her. She like to interrupt often and when ignore her, she tries to talk over us by talking louder. Sometime it can be very annoying. Studying up on the terrible two’s, it seems that Haruka’s symptoms are pretty mild compared to how bad they can really get. But of course, Haru is not two years old yet, so it is very possible, and even highly likely that she’ll get worse before she gets better. But, I see this as proof that she is growing, because without the terrible two’s it could be signs that she is not developing intellectually or emotionally. Its their way of testing the water and kicking the tires on her her new “skills”. I have taken a few days off from work this week so that we can spend a few days at the country house in Chiba. Originally, we were planing to leave today, but my wife had to go to the hospital to treat some mystery ailment that had been bothering her for the last two weeks now. It turns out that she has some small kidney stones passing through her bladder but nothing to be worried about. The doctor said that she’ll be able pass the stones through her system in a few days. Meanwhile, we decided to stop at our local furniture store to look for a new living room rug. We also went there to get some ideas on how to decorate Haruka’s room that we’re hoping to move her over to by the end of the year. I can already tell it’ll be a difficult transition, because she’s already climbing out of her crib and crawling into bed with us in the middle of the night. Sometimes it takes me totally by surprise to wake up in the morning to see that Haru has stolen my pillow, my blanket, and most of my sleeping space. Progress-wise, Haru is continuing to learn new words in both Japanese and English at a tremendous pace. I estimate that she has a fifty word vocabulary. She can now identify many objects in both languages, and I think she distinguish which words are Japanese and which are English. She also knows to speak English with me and Japanese with her mother which is pretty amazing. This means that she code-switch pretty effectively, which is something I struggled with for a long time as a child. My wife also bought Haru the 1982 version of the movie Annie on DVD, which I enjoyed so much as a kid. Amazingly, Haru has taken a quick liking to it. She’s already watched it three times. Every time Annie appears, Haru would point to the TV and say “Annie! Annie!” Even more surprising, she’s already memorized the melody to some of the songs and she tries to hum the verses. The breakfast club, Haru (middle) and her friends. Haru and her friend playing in the pool. Testing out the rugs at the furniture store. Lately it seems Haru has been picking up new things faster. Her English vocabulary has increased a lot in just the last 2 weeks. She can now recognize and say words like apple,red, blue, up, down, ball, hamburger, eyes, nose, mouth, feet, and bear. But what really surprised me is that, she brought me one of her picture books one day, and pointed to some objects and asked what they were by saying This? This? I guess she’s imitating me, because I would usually point to objects in her books and ask what’s this? Another thing I found interesting was, just last night as I was preparing Haru’s bedtime milk, she came into the kitchen and started opening all of the bottom cupboards, so I said close close. At first, she looked at me kind of puzzled. And since I was still preparing Haru’s milk with my hands, I couldn’t close them myself, so I used my foot to kick them close. Haru then proceeded to open them all up again. So again I said close close, and she started closing the cupboards using her feet. This tells me that she is starting to associate words with actions now, so I have to be careful about how I show her how to do things. Finally the biggest surprise, which I noticed just last night is that Haru is able to whistle a little bit with her mouth. She was sitting on the living room floor looking at her books, and I heard a very faint whistling sound. When I looked at her face, I noticed that she was whistling to herself. I honestly don’t know where she picked that up. Maybe she didn’t pick up from anywhere and she started doing it just out of habit? Could it be that some learned human behaviors are self taught without outside influences? I haven’t written in a while, and there are very good reasons for this. First reason is that my wife took Haru to Yamaguchi to visit her grandparents and her cousins for a week, so I didn’t really have anyting to write about or any pictures to post. The second reason is because it was golden week (a series of national holidays) in Japan and I was pretty busy doing some home improvement work like rebuilding our wooden deck, and cleaning out the garage. But the main reason for not writing is… well …I guess it just plain laziness I suppose. But now that almost everything is squared away, and I’ve regained my energy and motivation, and so I’ve decided to write again. In the last few weeks, nothing too much has changed. Haru is finally starting to learn some English words. She knows how to say nose, mouth, eyes, and feet, along with the words she already knew how to say like bye bye, and banana. I have been trying to make it a point to make her learn at least one new English word a week. And although her pronunciation is not quite perfect, it is a lot better than most Japanese adults that I know. I think that if she keeps at it, she’ll become a pretty proficient English speaker. My mother’s in town again, and as usual she came with a lot of clothes and gifts for Haru. 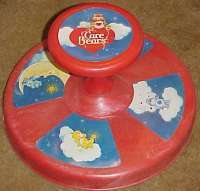 One toy that my mother brought was a Sit n’ Spin, an interactive toy reminiscent of the Tea Cup ride at Disneyland. However, from the quality of it, they seemed to have digressed from the quality of the original one that they sold in the 70’s. I remember having one myself when I was little. The original was made of thicker and sturdier plastic, and was able to support two small children, whereas the new one is a bit flimsy and barely able to support one 20 pound 17 month old, let alone two kids. I remember that I used to be able spin around in my Sit n’ Spin so fast, that it used to make be dizzy and make me feel like I want vomit afterwards. On the new one, getting Haru to spin around even once seems to be quite a chore, even with me helping her. As a matter of fact Haru seemed to figure out that she could spin herself around a lot faster if she stood on it rather than sit on it. It seems that the flimsy toy, now made out of Saran Wrap is just not up for the job, which is quite a disappointment, because I remember have so much fun on it. It also seems that they’ve come out with a musical version of the Sit n’ Spin that lights up and makes music. I am so glad my mother didn’t bring one of those. We have way more than enough toys that make an awful racket, we sure didn’t need another. In my opinion, there are some thing that were done right the first time and shouldn’t be made “better”. Rather than adding all of the musical gizmos and noise making games to an already great toy, they should have concentrated that production cost in maintaining the sturdiness and ease of use of the older version. But of course, I am an adult now so who am I know what kids nowadays like. I just know that the older version was so much better and so much more fun and its a shame that my daughter might not know how much fun they really were way back when. sometimes toys are overrated, and a roll on a nice soft comforter can be just as fun. Crawling off of her ‘no frills’ version of the Sit n’ Spin. For the last several weeks, my wife has been having some issues with Haru’s bad behavior. Haruka has picked up a bad habit of hitting and biting. And no amount of scolding from my wife helped matters much. As a matter of fact, Haru seemed to mock her by either screaming back or just plain ignoring her. Last night Haru decided that she wanted to bite me. Even though her teeth are still baby teeth, they do pack a lot of power to point where it is quite painful. So when she did bite me, I wasn’t going to have any of it and scolded her for it. However, her reaction to my scolding was quite rude. It was as if I did scold her at all. She simply just turned away from me and starting watching TV. Again, I wasn’t having any of it. I wanted to be certain that she understood that biting and hiting were wrong and that she doesn’t do it again. So, I took her and pointed her towards me until she was looking at me again. This wasn’t easy and it took a few tries because she’d rather be watching what was on TV rather than listening to me scold her (which was understandable of course). Eventually, I got her look at me and maintain eye contact. I firmly scolded and made it absolutely clear that I wasn’t happy about her biting me. Unlike my wife, I didn’t use baby language to explain my point, but rather firm eye contact, and I elevated my voice a bit (not yelling though). I could tell she was getting the point (or at least she new I was upset), because her she got very quiet as opposed to rambling back at me like she does with my wife (I guess this is her version of talking back), and she maitained eye contact. She did try to walk away once, only to be greeted by me grabbing her and setting her down in front of me again. She started to pout and looked as if she wanted to cry, but was desperately trying to hold it in. This is the first time I’ve ever seen her do that. She’d usually just cry or throw a tantrum when she’s unhappy, but this time she looked as if she really didn’t want to cry. So at this point, I knew that she was sorry for what she had done. Hopefully she won’t forget this lesson. Today, Haru starts her pre pre-school. It’s more like daycare but only with the parent present. Its basically just a class to give her a chance to get out of the house, interact with other children her age, and do some activities. It’s only once a week, but it should be good for starters.